This place is one of my favorite spots in LA. 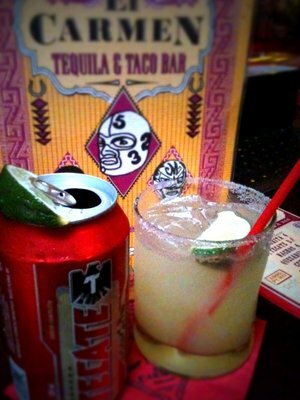 El Carmen is an unassuming tequila bar/restaurant tucked away on 3rd st. in the Mid-City West area. 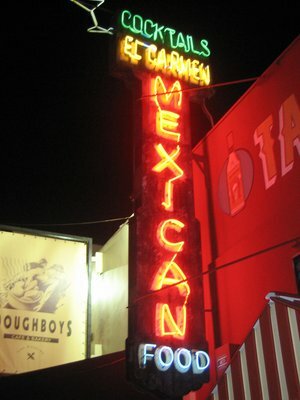 The entrance is just a plain door with a small awning and an old neon sign above it, but the tacos, insane tequila selection and Mexican wrestler decor make El Carmen stand out above the rest. 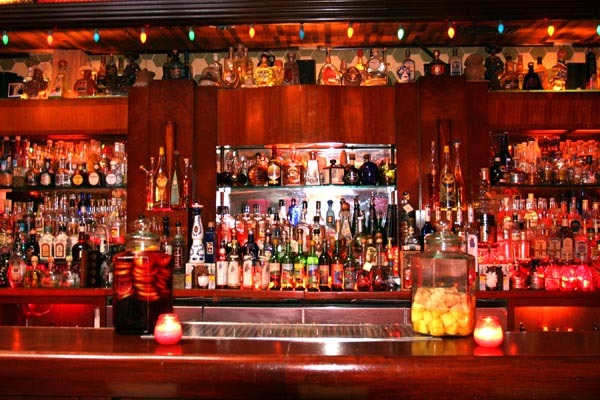 Their bar has every kind of tequila imaginable, complete with a tequila sampler and a novel-size list of margaritas. My personal faves are the jalapeno and the cilantro-ginger margaritas, but the pomegranate and blood orange margaritas are also really tasty and popular. This place is great for happy hour, a light dinner or also for drunken munchies (since the kitchen is open late). The menu has a variety of options like nachos, ceviche and flautas, but I have a soft spot for their carnitas taco, the chicken enchiladas, and the sweet corn tamale. At $4.25 for one carne asada taco, I wouldn’t classify this place as the absolute cheapest in town, but they use quality meat and the unique art and music filled ambiance is a lot of fun and definitely can’t be found elsewhere.